Share This on Twitter! Share this news with 3 of your friends. Just enter your friends' names and email addresses. Stand a chance to win Resorts World Sentosa $50 gift vouchers every month. 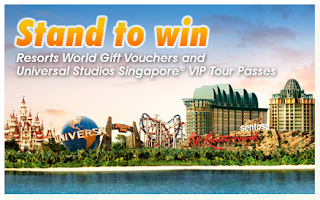 By January 31, 2011, they will give away a grand prize of 2 Universal Studios VIP Tour Passes plus $300 Resorts World Sentosa vouchers!